If you enjoy cycling, renting a bicycle is a great way to explore China. There are popular cycle routes in several of China&apos;s most famous cities. 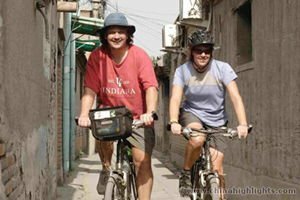 Cycling allows you to select your own route, and go at your own pace, see more for less effort, and get in amongst the local population for a real first-hand experience of Chinese life. See China Highlights&apos; most popular China Biking Tours. Biking can be one of the best ways to discovery Beijing. There are many riding routes in Beijing for outdoor-lovers to explore, you can get close enough to experience this amazing view, history, and culture of Beijing as you ride along, including the Forbidden City, Drum Tower, the Water Cube, the Bird&apos;s Nest, Hutong, the Great Wall and some other scenic suburbs, Read more about Beijing Biking Guide. Chengdu to Huanglongxi Ancient Town Route: start from Chengdu&apos;s downtown, Ride through several towns and you will arrive at Huanglongxin Ancient Town. There are a lot to see and do in the ancient town, such as the stone streets, the ancient temples, folk houses, tombs and memorials, and trying the local food served up in the restaurants and so on. Read more about Chengdu Biking. 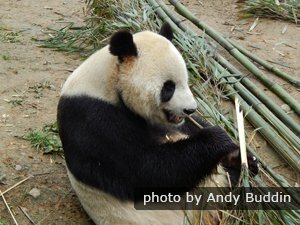 See China Highlights&apos; Chengdu tours. The modern city of Dali (下关; Xiàguān) and Dali Old Town (古城; Gǔchéng) are respectively southwest and west of Lake Erhai . Traveling around Lake Erhai by bike might be fun if you go slowly, the conditions are right, major construction doesn&apos;t block you way, and it doesn&apos;t rain. Two suggested routes for the western side and the eastern side of Erhai Lake covering ancient city of Dali, Three Pagodas , Houses of Bai People in Xizhou. You can enjoy the beautiful sight of the lake, see a lot of old houses in some small towns, gain a better understanding of the history of the ingenious Bai people and gain an appreciation of a culture that has been important in Chinese history. Read more about Dali Biking. Hangzhou is a city that is known for its relatively clean environment, relatively high standard of living, and the natural scenic places nearby. Near Hangzhou, there is a big lake called West Lake or Xi Hu and some mountains. 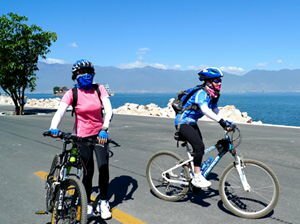 Some suggested bike routes near West Lake, Qianjiang River, Shili Langdang, and Wuchaoshang Mountain are provided. 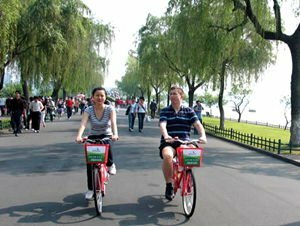 Read more about Hangzhou biking routes. See China Highlights&apos; Hangzhou tour with a cycling experience around West Lake. Thousand Island Lake covers five hundred and seventy square kilometers and has about one thousand islands. The journey around the lake is about 210 kilometers(130.5 miles) long. Biking most of the way around the Thousand Island Lake (千岛湖, Qiandao Hu) is interesting. You can appreciate the delicate islands and the blue water of the lake, see various kinds of animals around the lake and on various islands, and experience the local cultures. More about Thousand Island Lake biking. Xi&apos;an is an ancient city with a long history and a rich culture that attracts people. It&apos;s like a book that requires careful reading. You can ride around the city leisurely to experience the local customs of the street market, the historical relics, and the old city walls that witnessed historical events. This journey of different routes to go on for two or three days will leave you with many feelings. Want to experience one of the biking routes? Read more Xi&apos;an Biking and get more details. Or see China Highlights&apos; Xi&apos;an tours. Yangshuo is an incredibly beautiful place, characterized by crystal clear rivers, limestone crags, lush vegetation, traditional Chinese architecture and customs. 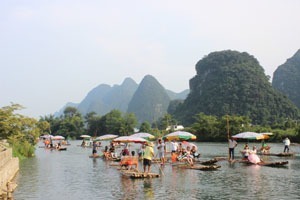 A classic Yangshuo bike ride, always combines hills, river, villages and scenic spots in a short loop. 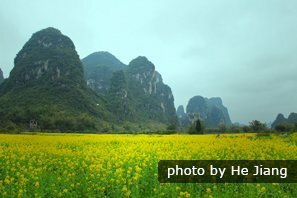 See more wonderful biking routes in Yangshuo Biking or see China Highlights&apos; Yangshuo tours. Qinghai Lake is the largest salt-water lake in China. Biking around Qinghai Lake will provide an amazing opportunity to experience Qinghai&apos;s natural scenery, rich culture and exotic foods. Read more details about Qinghai Lake Biking. See China Highlights&apos; Qinghai Lake Biking Tour. 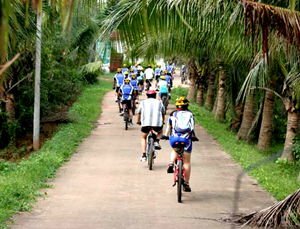 Hainan has a very pleasant environrment for biking, offering beaches, mountains, coconut plantations, waterfalls, rivers, minority villages, and a couple of cities for exploring. The picturesque island scenery with its gentle sea breeze, sandy beach, and tall coconut trees make the route a popular one among bicycle enthusiasts. Learn more information about Hainan Island Biking. 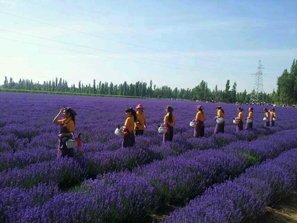 China Highlights has been specializing in tailor-making China tours for over 10 years. 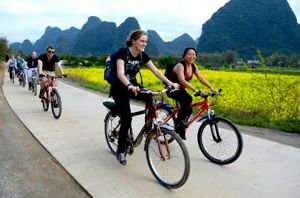 If you are interested in biking in one of the above cities, China Highlights can help you design a tour to your requirements. Choose a rent good quality bicycles that suit to yourself. Check your bike before you et out, especially to make sure the brakes work well. Wear light clothes and sensible shoes, wear sunscreen in the summer in case you will get burnt by the sun, or wear a hat. Take rain cape in case it is rain when you are biking. Bring plenty of water if you&apos;re riding somewhere out of the way. It is easy to get dehydrated. Take a map with you (a map with Chinese on it will be better.) When you ask the way, you can point to where you want to get to and ask “Zenme qu?” /dznn-muh chyoo/(‘How to go?&apos;). See more tips for both the occasional and experienced cyclist on getting your bike repaired, and safe cycling in China, and so on. China has a number of annual cycling road races in scenic areas that are well worth seeing if you are a cycling fan, and are able to be in China at the time of the race. They may not be as famous as the Tour de France, but the competition in these races is just as fierce. The Huangshan MTB (Mountain Bike) Festival is the world&apos;s largest cycling race in number of contestants. It is held during the period from March to May. The specific time changes every year according to the weather. Qinghai Lake International Cycling Race is held at a high elevation of 3600 to 5000 meters above sea level, it is the "highest" international road cycling race. The event is held during the period from July to August every year since 2002. 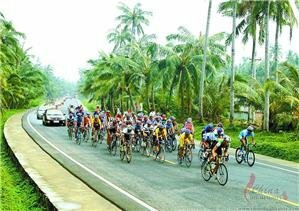 It is the largest international road cycling race and top of its kind in Asia. Read more about Qinghai Lake International Cycling Race. Tour of Hainan, successfully held for six years since 2006, has upgraded to a 2.1 HC level, the top in Asia. It is an annual event, taking place at the end of the year. Covering over 1,000 kilometers, the race includes all types of cycle racing, such as plain road, hills, mountains, and time trial events. China&apos;s traffic laws and particularly road traffic practice are often different from in the West. Read more about Traffic in China. We hope the information provided will help you negotiate China&apos;s roads with understanding, tolerance, and safety. If you want to adjust the itinerary, we can tailor-make it for you. We can help you arrange your tour according to your interests and requirements.